CaMPAM is a social network for enhancing the effectiveness of marine protected areas (MPAs) in the Wider Caribbean. 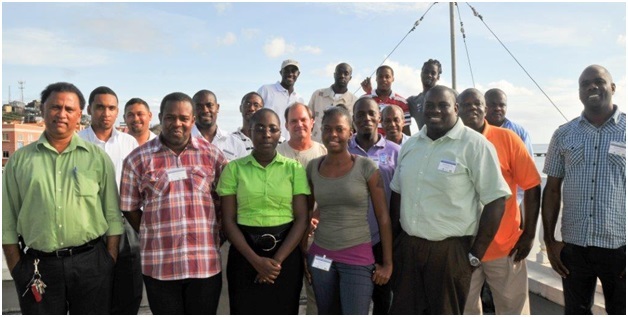 CaMPAM’s mission is to build the capacity of marine protected area managers, practitioners and fishers in the Wider Caribbean to promote the application of best marine management practices for the transboundary coordination of ecologically-connected areas. Established in 1998, CaMPAM is an initiative of the Caribbean Environment Programme of the United Nations Environment Programme and works in close partnership with the Gulf and Caribbean Fisheries Institute, NOAA’s Coral Reef Conservation Program and with other partners including government agencies, multilateral organisations and non-government environmental organisations, as well as individual experts. Participants at the Grenada MPA enforcement training, 2013. CaMPAM works on a number of capacity building programmes, including the Training of Trainers course and focused peer-to-peer training on priority capacity building needs. A small grants programme helps to support further sharing of best marine management practices. In April 2013, the Australia Caribbean Coral Reef Collaboration was able to be a part of the CaMPAM small grants programme and help Belizean participant Shane Young attend an MPA enforcement and capacity building workshop in the eastern Caribbean. Read the case study here. With the Gulf and Caribbean Fisheries Institute and other partners, CaMPAM maintains a database of MPAs of the Caribbean region and manages a list serve among Caribbean MPA practitioners. CaMPAM also coordinates annual MPA science and management-related meetings with the participation of resource managers and fishers at the annual meeting of the Gulf and Caribbean Fisheries Institute. Emma Doyle is an environmental management professional with more than 10 years’ experience working in Latin America and the Caribbean. Emma studied coastal zone management at Sydney University and has a Master of Science in urban environmental management from Wageningen University in the Netherlands. Emma works in support of capacity building for marine protected area management for the Caribbean Marine Protected Areas Management Network and Forum (CaMPAM) and the Gulf and Caribbean Fisheries Institute (GCFI). She is also Advisor to the Wider Caribbean Sea Turtle Conservation Network (WIDECAST) on biodiversity monitoring. In her current role, Emma has been working with the Australia Caribbean Coral Reef Collaboration to facilitate the sharing of experience between MPA mangers and to promote the adoption of best MPAmanagement practices.